It's unfortunate that this next love letter was almost definitely never actually sent to a girl named Jessica, or any girl for that matter, as it's a beautifully conceived plea from a geek of (nearly) the highest order. If it weren't for the mix up between Luke and Han's Tauntauns it would be perfect. You’ve asked me to stop writing these letters. You’ve told me they will never change things between us. But I can’t, Jessica. I can’t just… let you go. Even Darth Vader, an evil Sith lord, couldn’t leave his son to die at the end of “Return of the Jedi”. You make me feel so safe, Jessica. So warm. I want to crawl up inside you. Like Luke Skywalker crawled up inside his tauntaun to protect himself from the sub-zero temperatures of Hoth, where the Rebel Alliance was hiding from the Galactic Empire. Please, Jessica, give you and me a try - or as wise Jedi once said, "Try not...Do, or do not. There is no try." Come on, Jessica. Let's "do" it. Let's French. Then again, maybe you're right. Maybe we're from different galaxies, far far away from one another. Maybe you're "not the droid" I'm looking for, and I should give up and "move along"...with my heart. 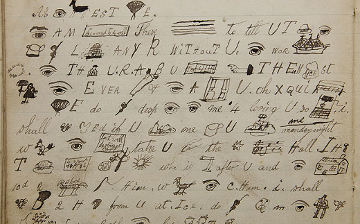 This incredible and inventive love letter, written approximately 100yrs ago, was sent by William Weightman to a lady he had seemingly been admiring for some time. Rather than send a normal letter indicating his intentions, William decided to draw pictures to form some of the text. For example, the word 'Dearest' is formed using a small picture of a dear followed by 'est'. Try and work out the message before reading the transcipt. Should you thank someone for that? It all seems slightly desperate, to the point where it transforms all that was written before it. This letter was written by legendary Mexican artist Frida Kahlo, on the back of an envelope used to hold jewellery whilst staying in hospital. 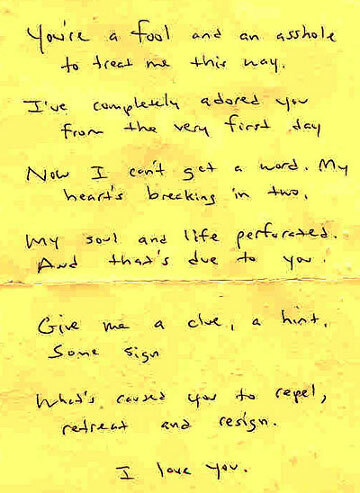 The letter was meant for her husband Diego and was sealed by Frida with a lipstick covered kiss. It's hard to confirm whether the following letter is genuine but, as an optimist, I'm going to believe that it is. It was apparently found by a reader of Found Magazine back in 2003, sitting next to a computer in a school library. It's one of the sweetest letters you'll ever read, and incredibly honest to boot. 1) Would it be to early to start holding hands? 2) Am I at the "Honey point" yet? Thank you for saying yes. The usual answers I get are no way; are you stupid? ; NO I already have a boyfriend. Or sometimes I'm to damn shy to ask a girl out. 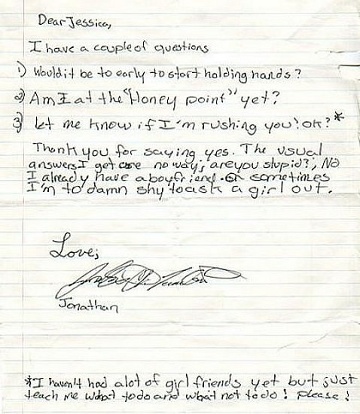 *I haven't had a lot of girlfriends yet but just teach me what to do and what not to do! Please! Apparently there's a bulletin board within the Mozilla offices which is covered in letters from fans of the company's products. 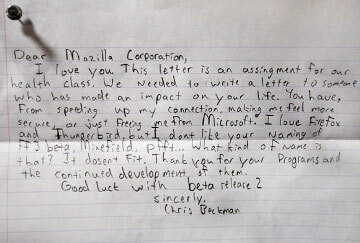 A particularly amusing example is this message from Chris Beckman, a Mozilla devotee who jumps straight in with 'I love you' and continues to gush from then on. I love you. This letter is an assingment for our health class. We needed to write a letter to someone who has made an impact on your life. You have, from speeding up my connection, making me feel more secure, or just freeing me from Microsoft. I love Firefox and Thunderbird, but I don't like your naming of FF3 beta, Minefield. Pfft... What kind of name is that? It doesn't fit. Thank you for your programs and the continued development of them. Good luck with beta release 2. Discovered by Thomas Pafford whilst taking his dog for a walk, this sad and eloquent love poem is actually written on the back of a restaurant's wine menu. What's caused you to repel, retreat and resign.